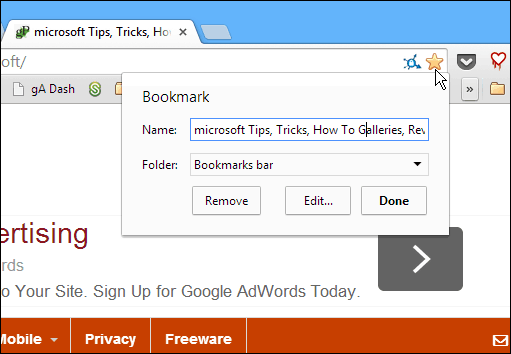 Firefox and Chrome users can set their bookmarks on the bookmarks bar to display only the website icon and no text. This gives you room for more sites. 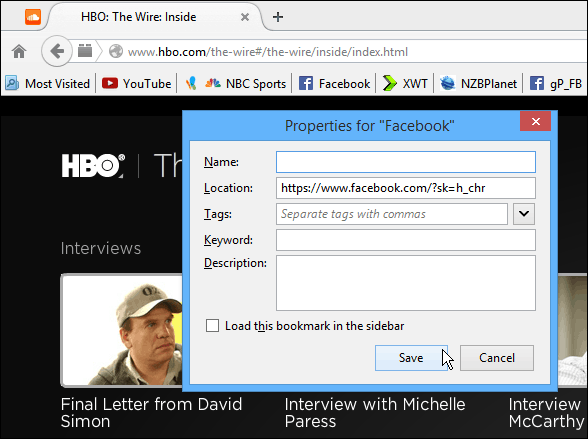 If you use the bookmarks bar on Google Chrome or Firefox, sometimes space is at a minimum. When you bookmark a site, it includes the site’s icon as well as the text description about the site. That is shortened when the icon is added to the bookmarks bar, but not completely. That leads you to having to click the arrow icon on the right for a dropdown of the rest of them. You can edit the text for the bookmark to something shorter, or simply just make it display the icon only. 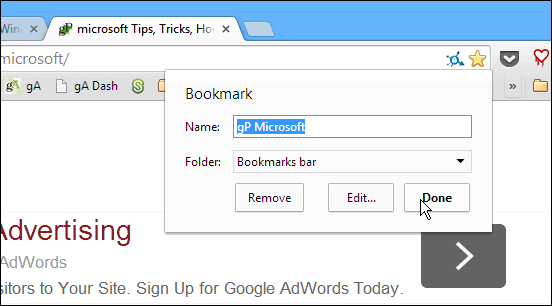 If you use bookmarks in Chrome, chances are you have a lot of them saved already. To edit them or only display the site icon, right-click it and then select Edit. Then, you can type in whatever you want in the Name field. Changing it to something shorter than the entire name and definition of the site allows for more room on the bar. Or, if you just want the icon, delete the field entirely. If you want to make sure the bookmark is edited or only the icon from the get go, click the bookmark this page (star icon) in the address field and give it whatever name you want or, delete the field entirely. You can do the same thing with Firefox too. Just right-click the bookmark icon and select Properties. Then under the Name field, clear out the Name field and click Save. 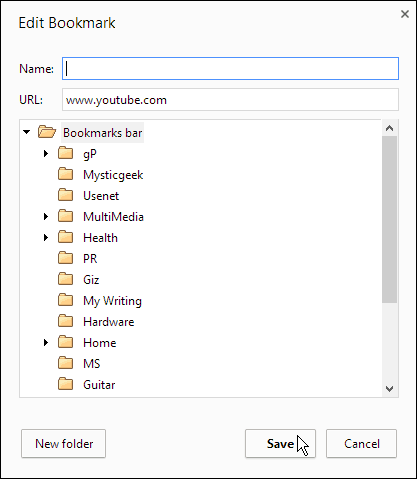 Here’s an example of several bookmarks that are only displaying the site icons. The other thing I like to do with Firefox is stick separators between each one. Displaying only the icon works for well known sites like YouTube, Google, and Facebook, but some sties you’ll want at least some initials or a brief description so you can tell them apart. When you make only the site icons display on the bookmarks bar, gives you a lot more space to display several more at a time. This is nice. I’d like it to just show a list of some favorites — even a very long list — on the new tab page, or something like that. I wish bookmarks were handled better in Chrome. 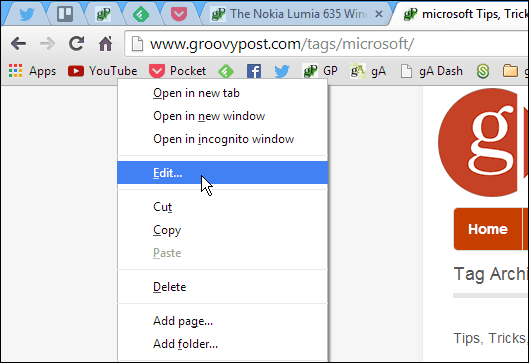 I still like the way IE has them as little 1 KB shortcut files. You can zip them into your own folder instead of dealing with a massive HTML file (when exported). Opera is confusing though (not sure about FF) — as it has options for “Stash” and “Bookmarks Bar” and “Speed Dial” all from the the similar button in Chrome that you press to bookmark something next to the address bar. But these are stored away in their own .js files, I think. (This comment relates just to Chrome). Some websites don’t have an associated icon. In this case, just a small, empty black rectangle with the upper right-hand corner folded over is displayed in its place. Not very satisfactory when you have several of these on the Bookmarks Bar. Is there any way to add an icon manually? I know this is easily achieved in IE but for Chrome ?? I have the same question…how do you create an icon for a website that has no icon? Just use Magic Marker on your screen for the problem spots. My version of Google Chrome browser eliminates the site’s icon when I change the Name. It turns into a white page. I checked the link and it is the same, just the name has changed. Any idea why? It seems to me that Chrome in this feature has taken a step backwards. It’s odd that in IE I can make my icons smaller with a mouse click…yet in the more up to date better Chrome…I have to go into each bookmark individually and change them…That seems like a lot of work…when a simple piece of code could just make them smaller. This is why Chrome is stupid. Four years on, and I don’t know if there’re changes to the bookmarking behaviour, or just my laptop, but Chrome does NOT show the site icons (just simple page icon) on the bookmark bar; it only shows them in Bookmark manager. This sort of UI logic is bewildering.